The Costa Brava is one of the most unspoilt of Spain’s Costas thanks to its rugged nature which rather inhibits building blocks of hotels. With so many little coves and bays hidden away there is always somewhere to explore. The climate of the Costa Brava in summer is less oppressive than other parts of the peninsular and in winter the sun still shines to cheer away those winter blues. This is my favourite part of Spain. The beaches are great for families and although the region doesn’t have an Ibiza party scene, there are a few spots to go for a bit of nightlife. Along the Costa Brava, which means rugged or wild coast, are numerous little villages where, for centuries, the main income was fishing. This traditional link with the sea continues today and what better way to enjoy a plate of grilled sardines or a bowl of muscles than by sitting looking out to sea with the smell of the sea air and the sound of waves. Catherine Dolan goes in search of some of the most idyllic locations. We start in the north at Cadaqués. At the end of a long windy road, Cadaqués was the home of Catalan artist Salvador Dalí and the coastline here and whitewashed houses are recurrent themes in his work. The square houses are packed tightly together on the hillside either side of the church which rises up above them. The restaurants along the front are so close to the sea they are almost touched by the water. Sit here and look across the bay to the Greek and Roman ruins and decide if you want to visit them. Enjoy a plate of seafood in one of the several restaurants in the old town which is on the edge of the water and faces the ruins and the impressive Greek jetty. After lunch you can paddle your feet in the shallow water where the Greeks and Romans used to anchor their ships. But if exploring the ancient stone jetty wear something on your feet. L’Estartit was once a nice little fishing village but is now a bit over-developed and rather touristy. It’s fine if you fancy some fish and chips, but best avoided if you’re in search of real Spanish seafood. At Platja de Pals there is a large expanse of beach at the end of which is the Platja del Racó (literally meaning corner of the beach) and the Solimar restaurant. Half on the beach, the Solimar has outdoor tables where you can have anything from a light snack to a three course meal, or between meal times a café con leche or a cerveza. The way the restaurant reaches out onto the beach is ideal for small children who can run around and play in the sand while their parents enjoy their food. Inside it is slightly more formal, with linen napkins and tablecloths. Not exactly a haute cuisine restaurant, the Solimar doesn’t pretend to be anything it’s not. It offers reasonably priced dishes and is popular with the Spanish. One of the highlights is the ‘dorada’ encased in salt, which is presented at the table in its white shell and watching the waiters break it off is a real treat to see. Once, while having a Sunday morning snack with a group of friends, we spotted football presenter Jimmy Hill and his wife tucking into some muscles. From the Platja del Racó take the coastal path round the corner, via the Platja Nudista, to Sa Riera. Alternatively Sa Riera can be approached from the road. This is a beautiful former fishing village, nestling between the hills on either side. The Miramar restaurant certainly lives up to its name as the views out to sea are fantastic. I recommend the grilled sardines here, they are delicious, accompanied with a chilled bottle of Bach. Again this is a restaurant where families with young children can eat while the little ones tumble around on the beach below. 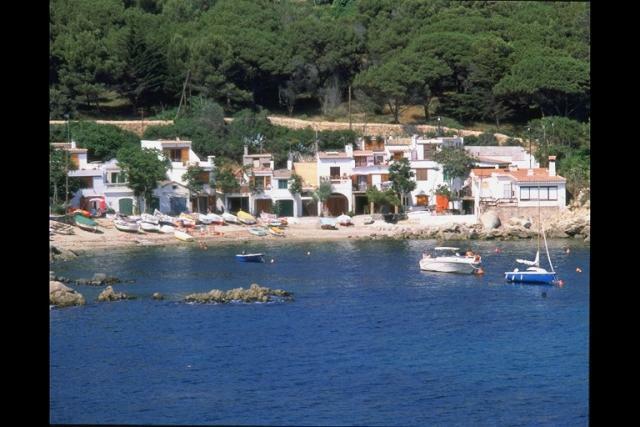 Sa Punta is a valley behind Sa Riera and the Platja Nudista, with a hotel and restaurant complex of the same name. In the 90s the hotel was added to the restaurant which already had a splendid reputation, attracting diners from a wide radius, and is especially popular with wealthy Barcelonians. This is one of the poshest restaurants in the region and the waiters, dressed in white tuxedoes, are there for the diners’ every need. It’s a real sit up and be good restaurant and only for really well behaved children. I remember being taken there when I was about 10 and my brother and I were on our best behaviour. To my horror I knocked my knife off the table and to this day I can hear the resounding noise of stainless steel hitting tiled floor. Fortunately a waiter was there in a nanosecond with a fresh knife. There is a Parador and the Hotel Aiguablava as well as a particularly good beach restaurant which among other dishes has the best fish soup in the area. This is the most upmarket of the Palafrugell beaches, with a tree-lined promenade stretching from the marina and diving school at one end of the bay along the sandy beach which reaches to the other. Being fairly small the beach quickly fills up, but has the luxury of showers. Llafranc is popular with the rich from Barcelona as well as British, including the author Tom Sharpe who I once bumped into while having my car repaired in nearby Palafrugell. Take your pick from the good range of restaurants along the promenade. There are expensive restaurants as well as more reasonable ones where you can relax over a wonderful plate of muscles and chips and watch the boats in the marina. A short walk around the rugged coast leads to Calella de Palafrugell, another fishing village on this craggy stretch of coast. As you turn the corner you catch a glimpse of the village with its arches. The white and blue houses, which cling haphazardly to the hillsides are reminiscent of something on a Greek island. Calella is a truly beautiful village, as much in the heat of summer as in the winter with the waves crashing onto the rocks. The restaurants line the front and look out to sea. This brings us to the end of our trail and also the highlight. Palamós has a working fishing fleet and fish auction every afternoon. If you like seafood you will love Palamós. As with most Costa Brava resorts, there is the usual collection of restaurants along the promenades, but the real treasures lie a few yards back in the old town and behind the marina. Our favourites are La Gamba in Plaza Sant Pere and Gamas in Calle Indústria.